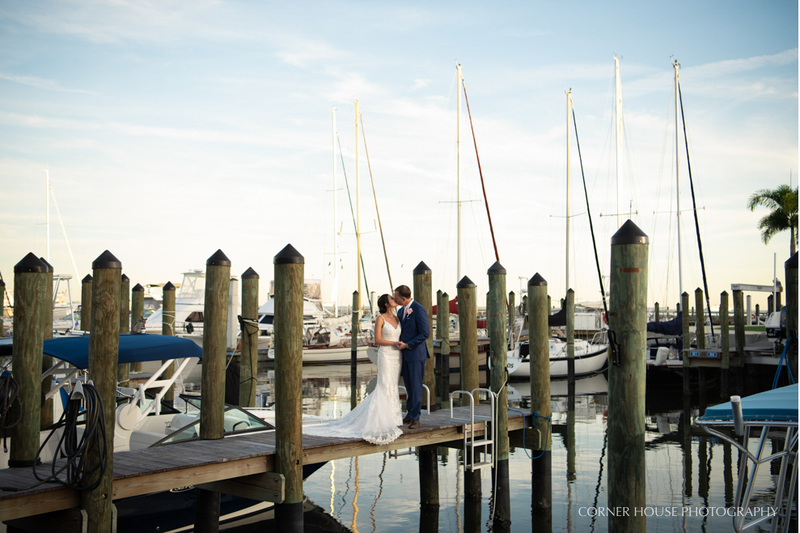 Jeanine and Dan tied the knot during their Tampa Yacht Club wedding in Tampa, Florida. Their wedding day vision was filled with laughter and love from family and friends, an oceanside ceremony, spectacular ballroom reception for dining, and dance tented dance floor underneath the stars. Both accountants, the two met by chance in an elevator at an accounting conference. Immediately taken by Jeanine, Dan made sure that he had asked for her number before she reached her floor. From there, they started dating and soon romance ensued, along with a proposal! Jeanine and Dan have such an easygoing personality and make you feel so incredibly welcomed from the moment you meet them. 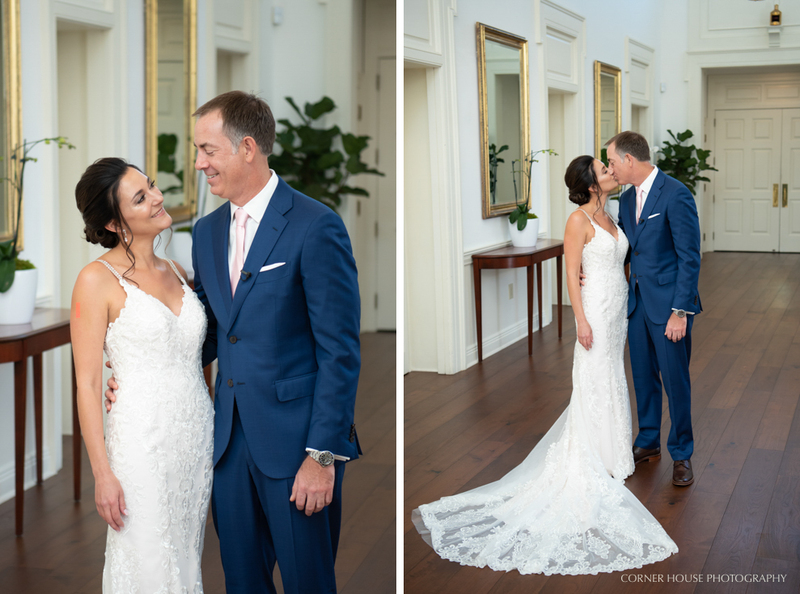 Arriving a bit early, we headed upstairs to the bridal suite to capture Jeanine’s details and getting ready while Dan headed over to the Tampa Yacht Club. Jeanine’s smile most definitely lit up the room, and I loved how concerned she was with making everyone feel welcomed – us included! Once Dan arrived, we captured him and his guys downstairs in a pretty nifty men’s parlor room. With both ready for their big day, it was time for their first look to begin! A grand hallway with natural light showering in and beautiful chandeliers made for the perfect first look location. Setting Dan up to see Jeanine, we could all tell how excited he was. Holding back the tears, our couple shared a beautiful moment together alone on their wedding day during their first look before the crazy fun began of formal portraits. Hidden away from guests arriving for our couple’s ceremony, we picked a beautiful blue room that complemented their ivory, silver, and gold color scheme for the backdrop of formal portraits. With a large bridal party in tow, it was critical to grab all of our formal portraits – including family too! – so that our couple could enjoy part of cocktail hour. Well let me just tell you that as soon as Aguie, our sweetheart’s pup, arrived the show totally stopped – I mean seriously she completely took the spotlight haha. As excited as everyone was to see Aguie, Aguie was just as excited to see Jeanine and Dan (well a little moreso Jeanine, but Dan understood haha). With a few special pictures taken of their family, Jeanine, Dan, Aguie, and Dan’s kiddos, we were off to prepare for the ceremony. As Jeanine walked down the aisle, it was clear to see how absolutely captivated our couple’s guests were. Their ceremony took place on the great lawn, overlooking the water and grandiose yachts parked nearby. 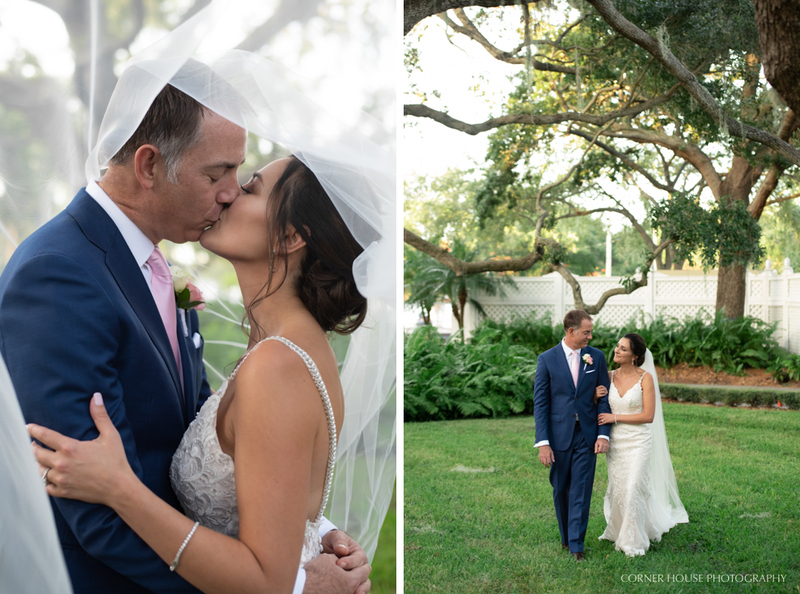 With “I do’s” said and a first kiss shared, we headed off to to beautiful front entryway of the Tampa Bay Yacht Club (special request from our bride!) and afterwards a few sunset shots with the yachts in the background. Sending our couple off to cocktail hour shortly after, we prepared for their reception entrance. I must say that while we loved every toast, Dan’s son and best man completely nailed the humor and had everyone laughing the entire time. Our night ended with dancing, more dancing, and even more dancing before a few quick night portraits in front of the yachts, along with hugs goodbye. Wishing our sweethearts and their family and amazing life together filled with the same love for eternity that they felt on their special day!